After sailing for three nights across the East China Sea and up the Yangtze Delta to the Huang Pu River, we arrived at Shanghai. This is a very modern city of 23 million people,which makes it the largest city by population in the world. Some of the Chinese on board told us that when they were young, the East side of the river ("Pu dong") was all farmland, but now it is the new financial district and full of skyscrapers. They were designed by architects from many countries, so similarities can be seen to other well known buildings. 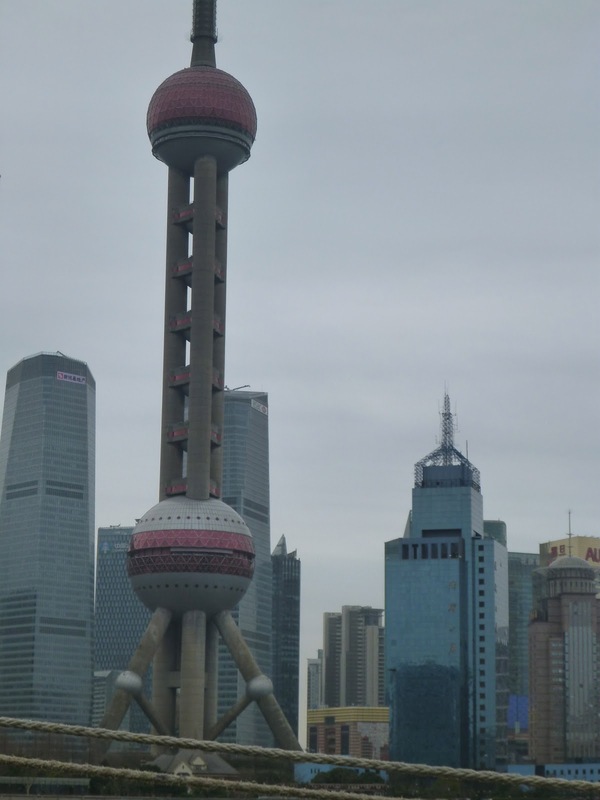 I took a city tour the first day (9 a.m. to 10 p.m.) and the guide told us that 4,300 skyscrapers (over 15 stories) were built in Shanghai since 1993. Many of them are up there with the tallest in the world, although Dubai still holds the top spot. The West side of the river ("Pu shi") contains the former European concessions and Chinatown, where the native workers that serviced the concessions lived. It is dominated by the Bund (Hindi for "waterfront"), which stretches from the former British consulate to the Fairmont Peace Hotel. One side of the street is classic British stone buildings, now mostly Chinese banks and hotels. The other side of the street is now a park. Another area is the French Concession, with a lot of department stores, restaurants, and bars. We were warned that the department stores were very expensive, with a 40% duty of foreign goods. We went past a lot of upscale stores and huge shopping malls, so the Chinese must like to buy Western goods. Many places are decorated for the upcoming Chinese New Year's next week. 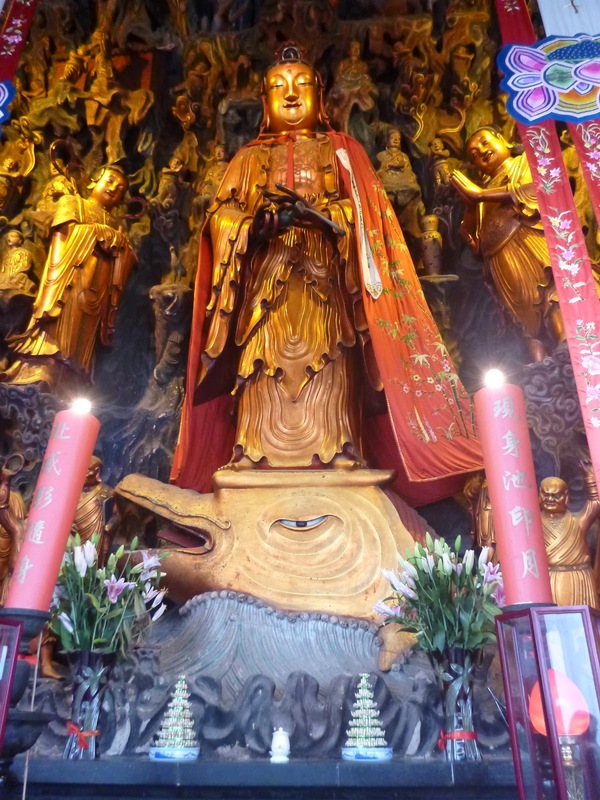 Our first stop on the tour was the Jade Buddha Temple, built in 1882. It includes two beautiful white jade buddhas, one sitting up (3 tons of solid jade) and another smaller one reclining. Both were brought from Burma by a monk and there is no knowledge of how old they are. Inside the temple is the Fo Yuan Tea House, where we got to sit and watch a woman prepare herbal teas for different medical problems before trying a few. They told us that Chinese do not use teabags, but prefer fresh ingredients. It sounds like a good idea. Next we went to Old Town to see the Yuyuan Garden. A garden in China includes several elements, including trees, water, fish, and a house. This one was built by a government administrator in 1559. There was a large pond with rock formations as a background. They did not have cement back then, so used sticky rice to bind the stones together. They do not let kids climb on the rocks. A centerpiece is the Exquisite Jade Rock, a porous 5-ton boulder. It's not jade, but the cool thing is that water runs out of all 75 holes simultaneously when it rains. 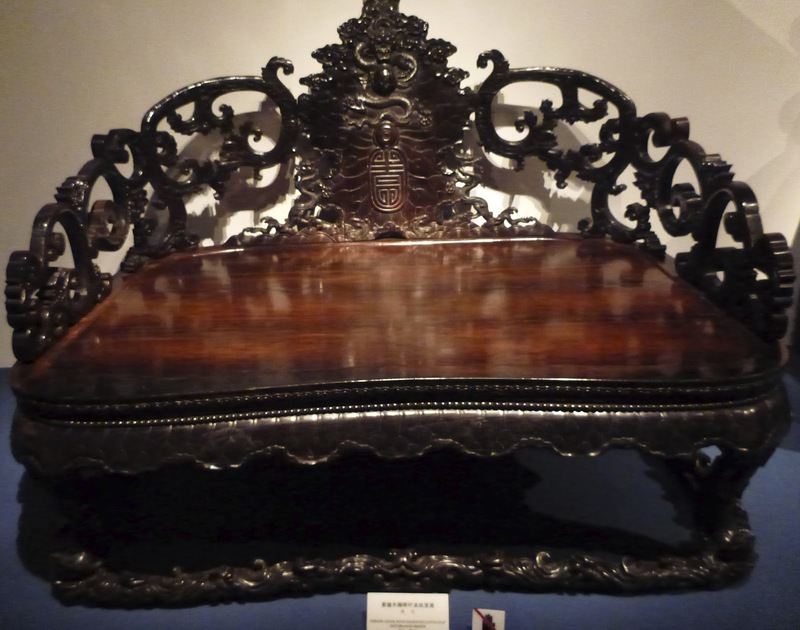 Rumors about its origin include the story that it was meant for the imperial palace in Beijing, but was salvaged after the boat sank off Shanghai. The fellow also got in trouble for putting dragons on his roof, which were only supposed to be used by the imperial family. He avoided punishment by cutting off the toes of the dragons and calling them something else. There are several buildings and open pavilions, where screens and curtains insulated in cold weather. 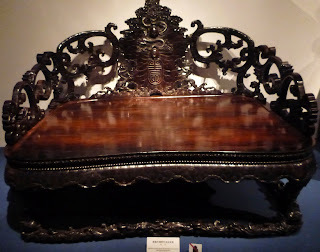 Apparently the Chinese were not as fond of sitting on the floor as the Japanese, since the furniture (original) consisted of many fine tables and chairs. The garden is surrounded by Chinatown. The buildings look like old Chinese style but our guide told us they were built in the last 25 years. Lots of people were out enjoying the fast food restaurants and shops. We went to the Silk Museum and learned about silk production. The moths make cocoons, which consist of a single thread of silk. We saw 100 year old machines that unpin the thread from the cocoons and form it into multi-strand thread. We saw how they then put it together and make quilts of many layers of the threads put together. You can buy a queen size quilt with plain cover for $100, which seems a bargain for the work involved. We stopped for lunch at the Seagull Palace restaurant on the Bund. Our group of 26 sat at three round tables with large lazy susans the food was put on. You get a very small plate, a teacup, a soup bowl, chopsticks and a fork. We started with some vegetable dishes, then they just kept bringing more chicken, beef, rice, cabbage, etc. Every so often a new dish would show up and we would spin the lazy susan around till everyone got some. We ended up with a very large variety of food and felt very full, even though we got only a little bit of any one thing. One exception was that Grayson, a five year old sitting next to me, wouldn't eat anything but the french fries, so he took a lot of those. The rest of us were eating french fries with chopsticks, which didn't seem strange at the time. After lunch, we went to the Shanghai Museum, designed in 1996 with a square base and a round top, to reflect ancient Chinese philosophy that the earth is square and the sky is round. In the front of the building are massive marble guardian lions. 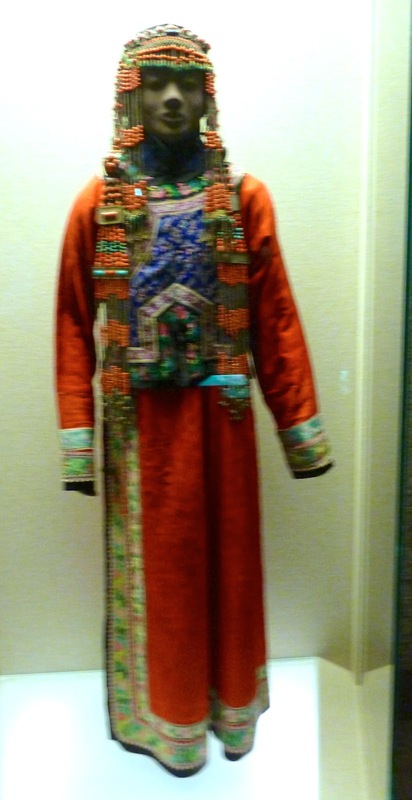 The museum reflects arts and crafts of China's 56 minorities, as well as the numerous dynasties. There are bronzes, ceramics, calligraphy, paintings, jade and ivory works, bamboo and lacquer wares, seals, coins, furniture, etc. I particularly enjoyed the textiles, with weaving, brocade, batik, tie-dye, and embroidery. The embroidery used thread ranging from horse tail to gold. We were getting on the bus after the museum when one of the professors on the tour, who had seemed fine all morning, apparently had a heart attack. I was near the front of the bus but turned to where he was sitting in the middle as someone said, "Something is wrong with Wade" and watched as he gasped, rolled his head around, and seemed to faint. The husband of one of the faculty had just arrived from the U.S. that morning to join her and had not even been to the ship yet. He is an internist and was able to start CPR right away, as soon as they got the man off the bus and onto a flat surface. CPR continued for about 15 minutes until an ambulance got there. It was unsuccessful but they carried on anyway, since a dead body in a foreign country is no laughing matter, so they didn't pronounce him dead until he got to the hospital. The other two nurses in the group helped with CPR, while I sequestered the wife (also an RN and Director of Nurses) away from the CPR site. The tour guide was great and went with the wife in the ambulance to the hospital while the rest of us waited with the bus for another tour guide to join us. Our scheduled walk along the Bund turned into a drive since we had lost a lot of time. We drove to a restaurant in the old French concession for dinner. This was a similar set up to lunch but the food was not as good. We then got on the bus and went to the China Circus World to see the ERA acrobats, who are supposedly the best in the world after Cirque de Soleil. I always enjoy watching Chinese acrobats, and these did not disappoint. Back to the ship by 10 p.m., quite a long day! The next day I walked along the Bund and visited the Peace Hotel. It is amazing inside and has a 1920's art deco feel, even the stuff in the gift shop. I can just imagine the men in their tuxes and the ladies in their cheongsams chain smoking in the jazz lounge or the chi chi bar. I went to China Bank on the Bund and asked about buying a Panda gold coin. Apparently foreigners are not allowed to buy gold in China. They have been importing a lot of gold and don't want it to go the other way. Getting back on the ship, the Dean told me four students got in trouble yesterday and won't be allowed off the ship again in China (four more days). I thought the death yesterday was bad enough, what with dealing with the aftermath and finding a replacement instructor for his classes (marketing). We'll see what trouble the rest of the kids get into here. The administration has a tough job.